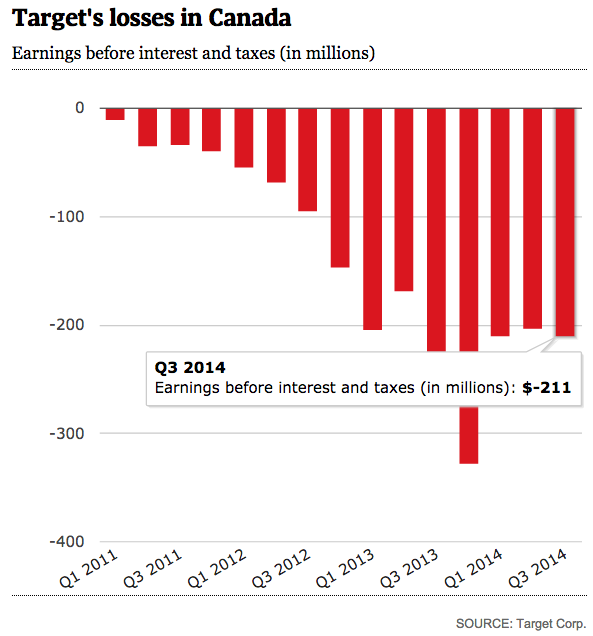 Target stores lasted less than two years in Canada (681 days) and the company revealed it will take $5.4 billion in pretax losses as of Q4, 2014. I’m sad to see Target exit Canada, it wasn’t surprising at all. Stores in our area (and across Canada) were plagued from the start, with low inventory to the point where aisles looked like they had been pillaged after a zombie apocalypse. I would imagine making profit would be difficult when you have–nothing to sell (insert imaginary caps lock). As an official Apple reseller, the closing of Target locations does have a silver lining. Most stores are probably going to be having a fire sale on goods and third party accessories. As for iPads and iPods, I imagine slight discounts but nothing major, unless stores are really desperate to clear stock. Target says merchandise will be marked down “in approximately 2-3 weeks”, pending Court approval of the company’s plans to hire a liquidation firm. Are you sad Target is leaving Canada?